Have you ever heard of a condition called retinal detachment? We hope so, but if you're like most people you probably haven't. Even if you have heard of it, do you know what the symptoms are? Most people don't know but much like a heart attack, retinal detachments are considered medical emergencies and require immediate treatment to prevent permanent vision loss so let's make sure you know what to watch for! "... a retinal detachment happens when a part of the retina pulls away from the underlying tissue. It can happen to anyone"
Who is at risk for a retinal detachment? Unfortunately, everyone. Some people have a higher risk, such as people with high nearsighted prescriptions or people with a family history of retinal detachment, but anyone with eyes can have their retina detach. Your retina may detach after an eye injury or accident but that's not required for a retinal detachment to occur. This is what a detached retina looks like when your doctor looks inside your eye. It's not something we want to see! So how do you catch and stop a retinal detachment? Well, the main thing is to have regular, dilated eye examinations. 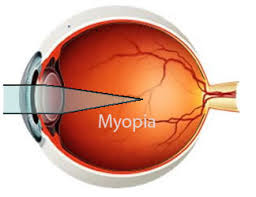 That helps your doctor of optometry check your peripheral retina for any problems like thin areas or retinal holes. Sometimes though your retina will look perfect and you still end up with a retinal detachment! So what then? "Retinal detachments cause flashing lights, floating spots, curtains waving in your vision or a combination of all three!" If you have questions about retinal detachments or anything else feel free to contact us on Twitter, Facebook, Google +, via our website or phone us at (403) 474-6744. What’s the difference between an optician, optometrist and ophthalmologist? I remember once while I was still in school and someone asked me what I was studying. I said that I was studying to be an optometrist and without batting an eye they looked at me and said “Oh, what’s it like to work with teeth?” So close but so far. There is a lot of confusion out there about what we in the industry refer to as ‘The Three O’s’, perhaps better known as opticians, optometrists and ophthalmologists. Even for people who are reasonably familiar with the optical industry people often ask me what the difference is. It absolutely can be confusing but let’s think of it in a way most of us are very famliar with. "Opticians are sort of like technicians." Opticians are sort of like technicians. They receive an optical prescription and fill it. They are your lens and frame experts. In Alberta they take a two year course to learn how to fit lenses properly and take all the necessary and extremely important measurements. They learn all about how to adjust frames to fit your face properly as well as what frames will work best on which face shapes. They know all about things like progressives versus bifocals, refractive index, anti glare coatings and a whole bunch of other technical things that are vital to you getting the right lens. They are an integral part of your vision care team. In case you weren't sure, this is what an optometrist might look like. "You should see an optometrist regularly to pick up any problems that are happening silently, with no symptoms." Optometrists are like your family doctor. You have any sort of problem with your eyes and we are the people you need to come and see. It might be a problem seeing, a red gooey eye or maybe you got something in your eye that won’t come out. You come see an optometrist and we’ll fix you up. Of course just like getting a yearly physical you don’t have to have something wrong to see an optometrist. In fact you should see one regularly to pick up any problems that are happening silently, with no symptoms. Optometrists in Canada take a minimum of a three year undergraduate degree followed by a four year course at the only English speaking Optometry school in Canada at the University of Waterloo or the only Canadian French speaking school at the University of Montreal. They are then required to write national board exams before being licensed to work in Canada. "Seeing an ophthalmologist requires a referral..."
Ophthalmologists are eye surgeons performing complex eye surgeries. They are medical doctors who have gone on to do even more schooling to specialize in the eye. Much like other specialists like brain surgeons, heart surgeons, kidney specialists etc you require a referral to see them. It is the job of an optometrist or your family doctor to refer you if there is an eye problem beyond what we are able to treat. For example, if you had a cataract that required surgery, an optometrist would refer you to see an ophthalmologist that specialized in cataract surgeries. There is a lot of confusion about what optometrists really do. We are so stereotypically associated with asking people "Which is better, 1 or 2?" and correcting vision problems that people are sometimes surprised to hear that we do a lot more! To help with the confusion I decided to start this new blog series "My eye doctor can detect which disease?". Some might surprise you, some might not. In today's blog I want to go over one that you might not expect: High blood pressure. High blood pressure is extremely common. Approximately 20% of adults have high blood pressure with another 20% having high normal blood pressure (which puts them at higher risk of developing high blood pressure later on). Of these people another 20% are unaware that they have high blood pressure at all! This is important because as you may have heard high blood pressure is a silent killer. It has no symptoms so people are often not aware there is a problem until something serious happens like a heart attack or a stroke. So how can your optometrist help? When we look inside of your eyes during a routine eye exam we aren't just looking for things like cataracts, macular degeneration and glaucoma. We're also looking for signs of systemic (or full body) problems like high blood pressure. The eyes are the only place in the body where we can directly look at your blood vessels without having to cut you open. This means that we can look and see exactly what is happening. In high blood pressure there a few key things that we are looking for. In this picture you can see the silvering of some blood vessels and also see how some blood vessels are 'nicking' or pinching the ones underneath. This is typically what I see in the average person with uncontrolled, untreated high blood pressure. Silvering of blood vessels - normally your blood vessels are a nice red colour but when someone has high blood pressure the blood vessel walls thicken. Over time this means that the blood vessels reflect more light and look more silver. Wavy blood vessels - normal blood vessels in the eye follow a nice smooth path. If blood vessels are really curvy that can be an indication of high blood pressure. Pressure on the blood vessels - as high blood pressure worsens the blood vessels may actually start to push down on other blood vessels restricting how much blood flows either in or out of your eye. Bleeds - As those blood vessels crush each other blood can back up and eventually burst the blood vessel causing bleeds in your eye. You can also end up with white areas on your retina that aren't getting enough blood. Imagine it like squeezing a hose: no water comes out one end and water starts backing up on the other side of the blockage. So much more - we can have things like leaking from blood vessels, swelling of the optic nerve and other signs. This is high blood pressure gone seriously wrong. Uncontrolled high (very high) blood pressure over long periods of time can lead to a very unhealthy retina. As you can see, there's no shortage of things that can go wrong in the eye with uncontrolled high blood pressure. Some of the more severe problems (Bleeding, leakage, swollen optic nerve etc) are fairly rare and only occur in very extreme untreated cases of high blood pressure. What I frequently see in my clinic are some of the early signs (the silvering, wavy blood vessels or pressure on blood vessels) and that let's me have a conversation about high blood pressure with you. In some cases your family doctor may already be aware and is either monitoring or already treating the issue. Sometimes though people have no idea and are shocked that they have high blood pressure and that it was found during a routine eye exam! It's important to keep blood pressure controlled to reduce your risk of so many very severe problems and early intervention and treatment is always better than trying to recover from something like a heart attack or stroke. If you have any concerns that you might have high blood pressure I would urge you to book an appointment with your family doctor. While optometrists can detect high blood pressure it isn't our area of expertise to treat and manage high blood pressure effectively. If we detect it in office we always will send you back to your family doctor to both confirm the diagnosis and if needed start treatment. What's most important is remembering to have regular health checks with both your family doctor and your local doctor of optometry! In General Eye Health Tags High Blood Pressure, Retina, Retinal Disease, Vision loss, Vision distortion, Central vision loss, Blurred vision, My eye doctor can detect which disease? So if I come in for an eye exam, what are you going to do to me? If you’ve been reading my blog you know there are a lot of reasons to come in for an eye exam even if you feel that your vision is perfect and that you don’t need glasses. You already understand that there’s the health and muscle function side of an eye exam that is just as important as how well you see. For many people who have never had an eye exam though they wonder what is involved. Anything new can be uncomfortable and if you feel like everything is fine people hesitate to come in. So let’s go over what an eye exam is all about. When you first come for a visit we’re going to have you fill in a nice form with a lot of your personal medical information. We need this to rule in or out certain eye problems and to know a bit more about your health. All of this information is kept strictly private and cannot be released to anyone or any group without your consent (this is true of ALL medical and personal information we obtain). Once you’re all checked in there are some preliminary tests done by our optician. At Eye Spy Optometry we first get an estimate of how well your eyes are focusing using a machine called an auto-refractor. These results are what I use as a starting point to narrow down an exact prescription. Next, we take pictures of the back of your eye as well as scans of both your optic nerves and your maculae. The optic nerve is what sends the information back to your brain and is affected in many disorders including glaucoma. The macula is the part of your eye used for fine central detail. There are many things that could go wrong here too but one of the most common is macular degeneration. These scans give us the ability to detect changes that may be related to an eye condition much earlier than just looking inside of the eye. Next you get to see me. I’ll review your medication and health information with you and then we jump right in. I check to see how you’re seeing with glasses if you have them, without if you don’t. I also check to see how well the eyes are working together and check pupils for signs of any neurological concerns. What comes next is the stereotypical part of the exam. I put a machine called a phoropter in front of your face and show you a variety of lenses, asking you which makes the image at the end of the room better. This is the part of the exam that causes people the most stress. Don’t worry though! My job is to help you through it and make sure we don’t come out with the wrong prescription. You can’t fail the test, I promise, because it isn’t a pass/fail sort of test! I will also have a look at the health of your eyes, inside and out, and finally I’ll check the pressure in your eyes, but not with that puff of air test! This is a traditional phoropter (used in the 'Which is better, one or two?' test). At Eye Spy Optometry we have a more modern, digital phoropter. The final step to your eye exam is to review everything. I’ll show you the photos and scans and explain what they mean, discuss any health concerns and review your prescription, if there is one. I’ll make any recommendations about how to help keep your eyes healthy or improve your vision that make sense based off of your results. Most importantly though, I’ll answer your questions. I do my very best to make sure everything we review together is clear but sometimes jargon slips in. Always feel comfortable asking questions and I’ll do my best to make sure it all makes sense. If you do happen to need glasses there is ONE more thing that happens. You get to pick out frames! That’s the fun part of the exam. There are so many different colours, shapes and styles to pick from and wide range of prices to suit every budget that finding something that works for you is fun and stress free. So book an appointment today! You know you should get everything checked out even if your vision is great. Now that you know what we do when you come to see us there’s no excuse not to give us a call at (403) 474-6744 or book online here. As always, any questions feel free to contact us on Twitter, Facebook, Google + or via our website. One of the most commonly asked questions I get asked is "What are those things I see floating around in my vision." Most people don't think my answer of 'annoying' is nearly as funny as I do and usually would like a real answer about what is happening. So let's address a problem almost everyone experiences at some point in their life, the visual phenomenon known as floaters. First of all, what are they? To understand that you need to know a bit about the vitreous jelly, which fills most of the eye and is where floaters form. The vitreous jelly is almost entirely water but it does have a matrix of 'stuff' (collagen and hyaluronic acid to be exact) that gives it a jelly like consistency. Don't think of it as jello though, it's more like an egg white. When we're really young the vitreous is really clear and everything is pretty much perfect. Over time though the jelly starts to break down and water leaks away. The collagen and hyaluronic acid are left behind and they clump forming the black or clear jelly blobs that we see moving around in our vision. What we are seeing is really just a shadow caused by these clumps. Floaters are easiest to see when the lighting is bright and the background is a light colour (so a bright sunny day with a blue sky or a brightly lit, white computer screen). Floaters sort of look like this... but not really. So, what can be done about a floater? Honestly, not much. 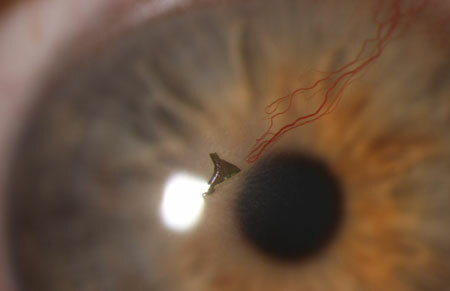 The most effective therapy is something called a vitrectomy where they literally remove the entire jelly from your eye and replace it with a silicone oil or a saline solution. This is an extremely risky solution and I don't know a single retinal specialist that is willing to do this surgery on someone for floaters. There is a laser procedure as well that blasts the floaters. This is a better solution than a vitrectomy but doesn't work as well. Many patients report that instead of having a few large floaters they now have a lot of small ones. With those new floaters you notice a curtain waving in and out of your vision. Any of those could mean that your retina has a tear or has detached. Retinal detachments are medical emergencies and can lead to complete loss of vision in hours. Retinal tears aren't quite as urgent but usually lead to a retinal detachment so you don't really want to mess around with them either. Really, it's best to play it safe. If you have floaters and aren't sure if they were there before or you aren't sure if they're normal floaters come in for a dilated eye exam. We'll put drops in your eyes for this type of exam (which is fully covered by Alberta Health Care) to have the best possible look at the very far outer edges of your retina to make sure there aren't any problems. If something is wrong we will get you to a retinal specialist as quickly as possible and keep your vision safe. There is a lot of confusion about what optometrists really do. We are so stereotypically associated with asking people "Which is better, 1 or 2?" and correcting vision problems that people are sometimes surprised to hear that we do a lot more! To help with the confusion I decided to start this new blog series "My eye doctor can detect which disease?". Some might surprise you, some might not. In honour of stampede we thought we would bring you the first in this blog series: Chlamydia. Please do not misunderstand, you will keep ALL of your clothes on during your eye exam. What allows us to detect chlamydia is not what you might think. Chlamydia actually can show up in your eyes. I know it's a little gross but it's true. To you, as a patient, you would think that you just had pink eye. Much like a normal pink eye there will be a lot of gooey discharge from your eyes and your eye will be red and uncomfortable. The trouble with chlamydial pink eye is that you can use antibiotic drops constantly and it just won't go away! A normal pink eye will usually go away on its own in about a week even without treatment. People usually come in frustrated because they've been on medication for weeks and their pink eye isn't improving. This is chlamydia. You don't really want to see what this looks like in the eye, do you? So if antibiotic drops don't help how do you fix it? The good news is that chlamydia is easily treated with a single, strong dose of azithromycin in pill form. Once the bacteria is destroyed the eye infection (and other symptoms) will go away. Remember that even if you can treat chlamydia quickly and easily it's always better to just not get it in the first place. You'll save yourself from an embarrassing discussion with your partner(s) if you protect yourself. Have a fun stampede but remember to stay safe! As always if you would like more information you can contact us on Twitter, Facebook, Google +, via our website or phone us at (403) 474-6744. Ebola has been making headlines around the world for weeks now. There’s a lot of fear and a lot of misinformation out there! I’ve spoken with many people and read many articles discussing the fear people have about the possibility of Ebola spreading to Canada. While I’m not an expert on Ebola by any stretch remember that Ebola is relatively difficult to transmit and the world is currently on high alert for anyone showing symptoms. Ebola is only transmitted through contact with infected fluids or tissues. The likelihood of it arriving in Canada is small and the chances of it spreading as it has in West Africa are also vanishingly small. Today’s blog is more for interest than anything else as I strongly doubt any of us reading this will be unlucky enough to ever meet someone suffering from the Ebola virus. So what exactly does Ebola do to the eyes? In most cases the horrific images you may have seen or heard about with blood pouring from the eyes does not happen. That occurs in only about 20% of cases. While Ebola is certainly a terrible disease the external bleeding we imagine to happen to all Ebola patients again only happens to 20% of those infected. Most patients end up with the eyes being red, much like you would expect in someone with very dry eyes or pink eye. The majority of the ‘bleeding’ that occurs with Ebola is internal and is not actually seen. Let’s now imagine that you were infected with Ebola but you pulled through. Can you expect any eye problems? Unfortunately yes. People who have survived Ebola are much more likely to get uveitis. Uveitis is perhaps better known as iritis and is an inflammation inside of the eye. People with uveitis have very sore, painful eyes that are sensitive to the light. It also causes blurred vision and if left untreated increases your risk for a variety of complications including blindness. Uveitis, is treatable with anti-inflammatory eye drops (steroids) and if treated early has no serious long term effects. If someone has uveitis it often will happen again in the future. No one knows why uveitis is more common in people who have recovered from Ebola as the disease is really not fully understood. Ebola is certainly a scary disease and as it spreads in West Africa there has been a lot of panicking in the media. Always try to keep in mind that it is very unlikely to arrive in Canada and that even if it does it is unlikely to spread due to the many different infection control standards we have in this country. If you do have any questions or concerns always feel free to contact us on Twitter, Facebook, Google + or via our website or phone us at (403) 474-6744. Psychedelic, surreal, multi-coloured shapes in my vision! Alberta is a land of ups and downs when it comes to weather (you may have noticed this recently with our ‘spring’ weather). +20C in December? -10C in July? -40C on Tuesday and +20C on Wednesday? These are just normal weather patterns here and as anyone who gets migraines can tell you it’s not fun. The wild temperature swings wreak havoc on our systems and can cause some funny things to happen. You’re busy doing your thing when suddenly your vision goes a little funny. You may notice shapes or colours or motion in your vision, not right in the middle but just off to the side. The effect may get larger or smaller. It may move faster or slower or not at all. Sections of your vision may simply vanish and go dark or you may still be able to ‘see’ but things you know should be there just aren’t visible to you anymore (like whatever is supposed to be there pulled a chameleon on you and has become invisible). You may have never had this happen but if these symptoms sound familiar you’re not alone. If you had this happen and didn’t panic at least a little I’m impressed. I’m an optometrist and when this happened to me even though I fully recognized my symptoms and knew what was happening my heart rate bumped up a few notches. This event is known as an ocular migraine. I know what you're thinking... what the heck did I eat? No, you aren't having a psychedelic trip, this is an example of an ocular migraine. Everyone experiences them differently though so if yours doesn't look exactly like this don't panic. The term ocular migraine implies that you should get a headache afterwards. That’s not always the case. Some people do have migraine headaches after seeing these images in their vision but not everyone. You may have heard of people getting an aura that tells them they’re about to get a migraine. That’s essentially what this is. Auras or 'ocular migraines' usually last about 20 minutes and are followed by a return to normal vision and depending on the person a headache, a migraine, or absolutely no pain. So, what the heck is going on? It’s not certain but what is believed to happen is that for some reason the blood vessels in the visual cortex (the very back of your brain… about as far from your eyes as you can get and still be in your head) shrink way down and not as much blood is getting through as before. This lack of blood flow means your brain can’t function the way it would like and you start to experience really bizarre things in your vision. It takes your brain, usually, about 20 minutes to figure out this isn’t normal at which point the blood vessels do one of two things. They either return to their normal size, blood flow returns to normal levels and you stop feeling like you ate a brownie you shouldn’t have OR the blood vessels expand to their maximum size stretching themselves to be as big as they can. It’s that extreme stretch that causes the horrible pain people experience with migraines. In some cases the vision changes can last longer than 20 minutes. This usually occurs if someone completely panics causing an adrenaline surge. The resulting stress levels can cause the visual changes to linger for about an hour. Here’s the real kicker. There’s not much you can do about this. We think that all those blood vessel antics are caused by the same things that cause migraines… so, almost anything (certain smells or foods, weather patterns, stress, lack of sleep. The list goes on and on). Migraine medication can be helpful if a person is getting ocular migraines all the time and it’s seriously interfering with their life but otherwise we just recommend that a person sit back and enjoy the show for 20 minutes. If you’re driving it is strongly recommended to pull over and wait it out. These vision changes are temporary and do not cause any damage to your eyes or your brain. So rest assured that if you have been properly diagnosed with an ocular migraine your eyes are safe and sound. I would love to leave it at that but there is one more thing. Not all flashes in your eyes are harmless. Retinal holes, tears and detachments can cause symptoms including flashing lights in your vision, floaters and a curtain moving in and out of your vision. These flashes do not go away in 20 minutes and generally are noticed at the very edge of your vision. Retinal detachments are extremely serious and cause permanent loss of vision. If you experience flashing lights in your vision of any kind it is best to have it properly checked by an optometrist. These visits are considered medically necessary and are fully covered by Alberta Health Care. I would advise against taking a risk. If you see flashing let an optometrist have a look at your retina to confirm everything is normal. For more information feel free to contact us on Twitter, Facebook, Google +, via our website, phone us at (403) 474-6744 or come in anytime. You can also read more at the links below.